Orientation - Orientation of the menu in the screen : horizontal line or vertical. Note: If the vertical orientation is used, it is necessary to adjust the menu width. Horizontal Alignment Of the Menu - Define the application horizontal alignment in the page as: left or right. Vertical Alignment of the items - Align menu items vertically as: top, center or bottom. Horizontal alignment of the items - Align menu items horizontally as: left or right. Friendly URL - This field allows you to change the URL that will be called by the application, allowed characters are the same available on URLs: a-z, A-Z, 0-9, -_. This option can also be changed on the home screen, on the "Friendly URL" column at the applications list. Menu Width - Width in pixels or percentage of the menu. Menu Height - Height in pixels or percentage of the menu. Iframe Width - Width in pixels or percentage of the size of the iframe where the applications are opened. Iframe Height - Height in pixels or percentage of the size of the iframe where the applications are opened. Hide menu items - Select the option to hide an item, instead of disabling it, when using security schemes or access control. Hide the menu toolbar - Remove the toolbar items instead of disabling them, if the security option is enabled in the applications. Open items with OnClick - Opens menu items only with the mouse onclick. Preserve icon space - Preserves icon space in the menu even if the item has no icon. Scrollbar - Enables the scroll bar. Select Language - Selects the language from the menu bar. Select Theme - Select the theme from the menu bar. Alignment of Theme and Language - Themes and language items horizontal alignment in the menu. Always show items - Show the items of the menu even if the applications do not exist or they weren't generated. Default Application - Menu start application: an application, blank or an URL. Open items in tabs - When this option is set as "Yes", menu tabs option will be available and the menu items will always open as tabs in a horizontal bar below the Menu. 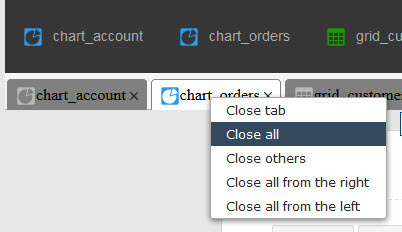 Tab context menu - This option creates a context menu to manage the opened menu tabs as you can see in the image below. Minimum tab width - Minimum tab width to standardize the sizes of all the tabs. Maximum tab width - Maximum width of the tab, if the width exceed this the text will be hidden. Show navigation breadcrumb - Show the navigation breadcrumb each time an opened application calls another application. Use default icons in the item - If set as "Yes" it enables the use of standard icons when the menu item has no icon, you are able to customize those standard icons inside the "Layout options >> Menu icons" or using the menu items options updating one by one. 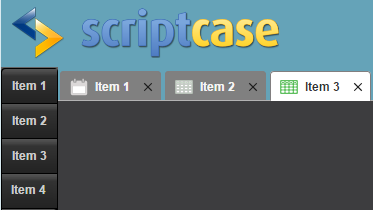 Use default icons in the tab - If set as "Yes" it enables the use of standard icons when the menu tab has no icon. You are able to customize the tab icons using the "Menu Items" options updating an image for each tab item. Default Application - Using this option you can select an initial application for the menu, this application will open once you run the menu for the first time.